Dark matter, which scientists believe makes up 25 percent of the universe but whose existence has never been proven, could be detected by the giant particle collider at CERN, the research center’s head said Monday. Rolf-Dieter Heuer told a news conference some evidence for the matter may emerge even in the shorter term from mega-power particle collisions aimed at recreating conditions at the “Big Bang” birth of the universe some 13.7 billion years ago. “We don’t know what dark matter is,” said Heuer, Director-General of the European Organization for Nuclear Research on the Swiss-French border near Geneva. Astronomers and physicists say that only 5 percent of the universe is known currently, and that the invisible remainder consists of dark matter and dark energy, which make up some 25 percent and 70 percent, respectively. “If we can detect and understand dark matter, our knowledge will expand to encompass 30 percent of the universe, a huge step forward,” Heuer said. The LHC, the world’s largest scientific experiment centered in a16.78 mile oval-shaped tunnel deep underground, is presently moving to colliding particles by the end of the month at the highest energy ever achieved. These multiple collisions at a total of 7 tera-electron volts, or TeV, will each create mini-Big Bangs, producing data that thousands of scientists at CERN and in laboratories around the globe will analyze. 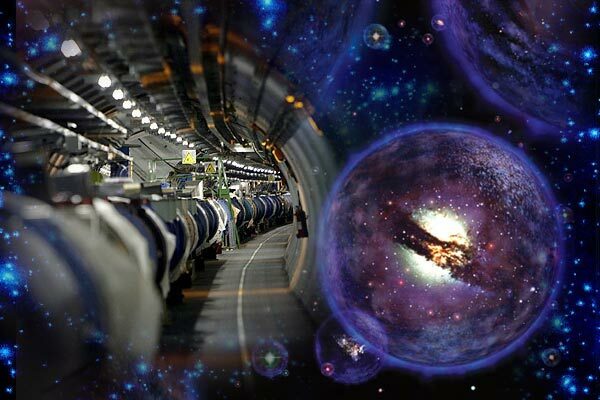 One widely publicized aim of the LHC is to try to find the theoretical particle that gave mass to the matter that spewed out after the primeval explosion and thereby made possible the emergence of stars, planets and eventually life — on earth and perhaps elsewhere. The mysterious particle has been dubbed the Higgs boson after the Scottish physicist who three decades ago proposed it to explain the origin of mass in the universe. Once collisions in the LHC are begun at 7 TeV, they will continue with only very brief breaks until the end of 2011, and then the machine will be shut down for a year to prepare it for years more of experiments at 14 TeV. 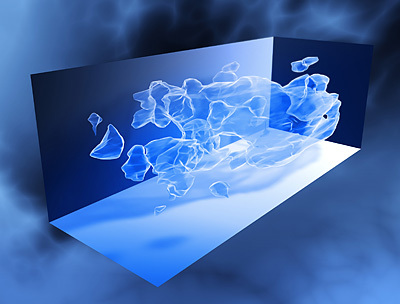 3D distribution of dark matter in the Universe.